What was the testimony of the "House of Princes" over which religionists of this doomed world gnashed their teeth? Judge Rutherford…in 1916 succeeded the late Charles Taze Russell of Brooklyn, founder-president of the International Bible Students Association. The San Diego Sun (1930 March 15 and 1931 January 9) stated the mansion had "all modern improvements", was worth $75,000, and the adjacent garage had a 16-cylinder Cadillac for Rutherford's exclusive use. The car would have cost about twelve times the $600 for a 1931 Ford! In 1919 Judge Rutherford and his "Bible Students" promoted the public sermon Millions Now Living Will Never Die. The sermon was published as a book in 1920. Therefore we may confidently expect that 1925 will mark the return of Abraham, Isaac, Jacob and the faithful prophets of old, particularly those named by the Apostle in Hebrews chapter eleven, to the condition of human perfection. The "Millions" message was nonsense. It was WTS rubbish. It wasn't even in the Bible! Rutherford's much-criticized drinking problem began at this time, his us-versus-them anti-religion propaganda became more provocative, and his demands for loyalty and unity more vigorous. Rutherford put the prophecies for 1925 off to 1926 and 1928 – both dates by implication rather than direct statements. This initially slowed the decline. Then in 1928 the outward flow became a torrent. The early yearbooks of JWs listed the names of their so-called "ordained ministers". Of the 256 names for 1926 some 45 were missing in 1927. Thus the most-committed followers decreased 18% in one year! At the rank-and-file level the turnover must have been tremendous! Rutherford halted the disintegration by advertising for new recruits via radio and by telling remaining followers their salvation depended on them publicly distributing WTS tracts, booklets and books. Also the Beth Sarim property was purchased in 1926 and the house built in 1929. Rutherford presented Beth Sarim to his cult as evidence the princes were still coming and that eternal life without sickness or poverty still lay just ahead. Both the grantor and the grantee are fully persuaded from the Bible testimony which is the word of Jehovah God and from extraneous evidence that God's Kingdom is now in the course of establishment and that it will result beneficially for the peoples of earth; that the governing power and authority will be invisible to men but that the kingdom of God will have visible representatives on the earth who will have charge of the affairs of the nations under supervision of the invisible ruler, Christ. That among those who will be thus the faithful representatives and visible governors of the world will be David, who was once King over Israel; and Gideon, and Barak, and Samson, and Jepthai, and Joseph, formerly ruler of Egypt, and Samuel the prophet and other faithful men named with approval in the Bible at Hebrews 11th. chapter. …the said Watch Tower Bible and Tract Society shall hold the title perpetually in trust for…the men above named. Brother Rutherford had a severe case of pneumonia after his release from unjust imprisonment in 1919. Thereafter, he had only one good lung. In the 1920's, under a doctor's treatment, he went to San Diego, California, and the doctor urged him to spend as much time as possible there. 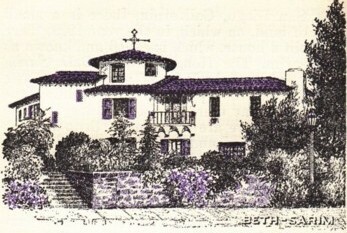 From 1929 on, Brother Rutherford spent the winters working at a San Diego residence he had named Beth-Sarim. Beth-Sarim was built with funds that were a direct contribution for that purpose. The deed, which was published in full in "The Golden Age" of March 19, 1930, conveyed this property to J. F. Rutherford and thereafter to the Watch Tower Society. Edward Gruss in Jehovah's Witnesses Their Monuments To False Prophecy cites inside sources that Beth Sarim was also built, "to get the drunken and declining Rutherford out of Brooklyn." Brother and sister Balko are in charge of Beth-Sarim… They have two children, a little girl now nearly two years old, and a little boy about six months. Beth-Sarim being "the house of the princes," and, as we confidently expect, to be occupied and used by some of the princes in the earth, it seemed quite appropriate that these children who are growing up there should be named in harmony with these scriptures. The princes did not return and the WTS sold Beth Sarim in 1948. Q.- What has become of the mansion? A.- It has been sold. A.- Because it was there, and the prophets had not yet come back to occupy it, to make use of it, and the Society had no use for it at the time, it was in charge of a caretaker, and it was causing expense, and our understanding of the Scriptures opened up more, and more concerning the Princes, which will include those prophets, and so the property was sold as serving no present purpose. Q.- Am I right that it was at one time forecast that in 1925 Abraham and other Prophets would come back to earth? A.- They were expected to come back approximately then. Q.- But they did not come? Q.- It was published, was it not, to the body of Jehovah's Witnesses that that was to be expected in 1925? Q.- But that was wrong? A.- Yes, and Judge Rutherford. When Rutherford wrote this, the emphasis was still on the realization of prophecy in the 1920s. A standard WTS procedure, however, is to promote several dates simultaneously so that when one date fails there's another "carrot on the stick". "Twenty five years" terminated in 1950. The JW leaders often give their failed dates alternative importance – they pretend the date was right but the precise expectation wrong. That's what they also did in 1950 regarding the princes. Brother Franz aroused and quickened the interest of his audience by asking: "Would this international assembly be interested to know that HERE, TONIGHT, in our midst, there are a number of prospective PRINCES OF THE NEW EARTH?" A tremendous and sustained clapping of hands and shouting for joy assured the speaker that nothing at the moment interested them more. Franz then outlined a new interpretation. The "princes" are Jehovah's Witness overseers the guys in charge of individual congregations. Some of these overseers would survive Armageddon and help to rule the post-Armageddon "new world". The Bible heroes would still be resurrected but after Armageddon. …Yankee Stadium in August, 1950, where the Witnesses were reminded of the old belief that God's faithful – Abraham, Joseph, David – would rise from the dead before the end of the world. This aroused tremendous expectations, which were heightened by the speaker, F. W. Franz, when he suggested that among those gathered together were the "Princes of the New Earth." The spectators were roused to tears by the prevailing excitement, expecting to see these biblical figures. Some stood up; others rushed to the entrance near the speakers' stand, where they would have a better view. The speaker quieted the crowd and … assured them that they were the new princes, those who had turned their backs on a world slated for doom and who must persevere in going forward to build the New Jerusalem. The post-Armageddon New World failed to arrive many times after 1950. Failed dates include 1975, the 1970s, "within our twentieth century", and for the period called "this generation". The princes – by the pre-1950 definition – are still awaited by JWs. Every time Armageddon doesn't come the arrival of the princes fails again and lots of other stuff fails too. The ancient Bible heroes didn't come, nor did Armageddon. Although the WTS held the title of Beth Sarim "perpetually in trust" it was a trust betrayed in 1948 when the place was sold. Had the authorities allowed a cemetery at Beth Sarim it might have been difficult to sell the property. But JW leaders weren't grateful and didn't apologize for the above outburst. That remaining one right religion is that of Jehovah's witnesses. It is not conceited for us to say that.